Really want to make some cards but can't find the motivation, or the space, at the moment. We are converting the stable that joins on to our very small house and have had to empty it completely to get the floor laid in there: Nightmare! I've also had a bad eye which has made things blurry for a few days but seems to have sorted itself now. So, here's a page created at the Tourc'h association on Monday using a 'Page Map' by Becky Fleck from October 2009. 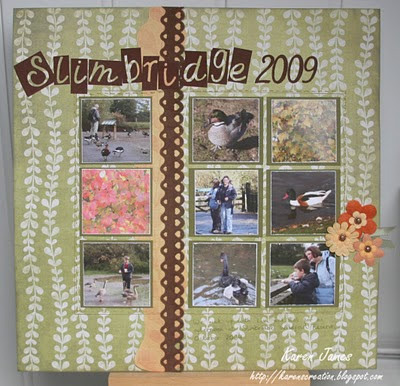 Used: MME Bloom & Grow papers with 'Wild Asparagus' adhesive ribbon, Bazzill 'capers' card, PM adhesive velvet, Cuttlebug Harmony alphabet, VersaMagic 'Olive green' chalk ink, flowers by Prima and Making Memories, PM Whispers marker, and a needle and thread! Je voudrais faire quelques cartes mais avec le boulot chez nous, je n'ai pas l'espace! Alors, voici une page j'ai créé le lundi à l'assoc Tourc'h-2-scrap. Il suivi une modèle de 'Page Maps' par Becky Fleck. J'ai utilisé: Papiers de My Mind's Eye 'Bloom & Grow'; ruban auto-collant de MME 'Wild Asparagus'; Bazzill 'capers'; PaperMania 'velvet' auto-collant avec Cuttlebug Harmony alphabet; encre verte 'olive' de VersaMagic; fleurs de Prima et Making Memories; stylo de PM, et des couture! 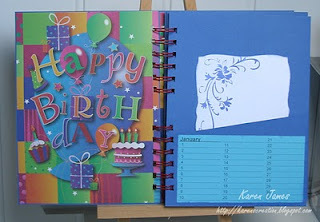 I've put a notelet piece, stamped with Inkadinkado stamps and blue Brilliance, in the front pocket ready to write the birthday greeting. 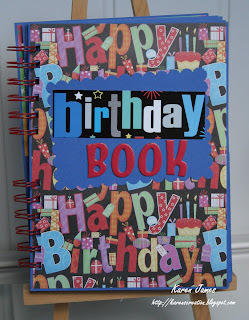 It would be nice to fill one with cards as a present for a non-cardmaker. J'ai créé une livre d'anniversaire comme une carte/cadeau pour ma belle-soeur pour organiser les cartes elle fera dans l'année. 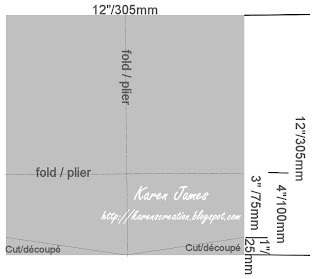 J'ai utilisé 6 feuilles de 305 x 305 mm pour les pages d'intérieur plus 2 pièces 15,4 x 20,4 décorée avec papier pour les couverture, reliure avec la Bind-It-All. Un autre exemple, avec le schéma pour plier les feuilles d'intérieur, est dessous ici. Here's a little something I made on Wednesday in a group. Buying the insert and fixings made it quite expensive but the case itself is made with pieces of 2.5mm thick board covered with some Scivertex I had left over from another project. It would be fairly easy to make the concertina to go inside as well but it was soooo much quicker to use a ready-made one ! Seeing (and hearing !!!) some of the others hammering a hole punch tool through I opted to leave fixing the handle until the next day and tried the Big Bite: Fantastic! 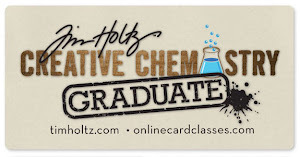 I had never tried that thickness of card and fell in love with my Big Bite all over again at how easy (and silent) it was. En peu de cartonnage j'ai créé mercredi avec carton de 2,5mm et scivertex. J'ai acheté les vis, fermeture et les pochettes d'intérieur: Alors, un peu cher! J'ai utilisé la Crop-a-dile 'Big Bite' pour faire les trous pour les vis: trop facile ! 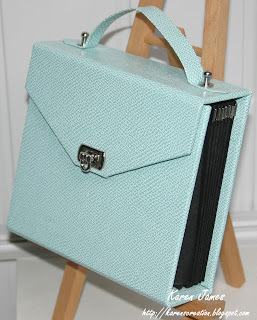 I had the idea of making one of these for my sister-in-law's birthday when she said she'd like to be more organised with remembering birthdays this year. She is another card-maker so I thought it would help her organise card-making in advance. I left her present with her when we were over at Christmas and will send a book instead of a card with a note tucked in the first pocket. So I have made two this week: This one is actually for me and is my proto-type and I have to finish off the second one to post to her (and remember to photograph it first!). 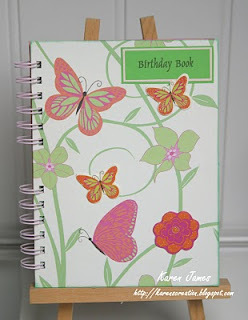 I'm entering this in Hels birthday challenge to celebrate the 'Sunday Stampers' being 2 years old. Hels makes all sorts of wonderful art so I recommend a hop over to her blog if you haven't found it already. 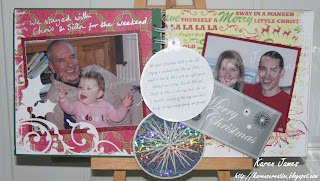 AND, this challenge is sponsored by The Artistic Stamper with some gorgeous Mabel Lucie Attwell stamps and Kling-on. I folded the card in half then turned up 4" (or whatever you want as long as you do the same on each), creased it really flat and then folded it out, cut sections off to get a slanted pocket (you could punch the edge for a different look), then refolded. 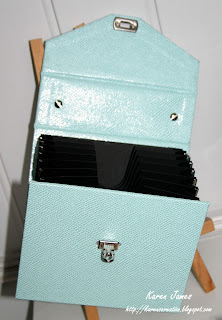 This gives an 6"x8" book - plenty of space for standard size cards and envelopes. Once it was all ready I punched the holes with the bind-it-all and fixed the wires, using over-sized ones to allow for cards to be inserted as well. I printed the months on matching plain paper and stuck them in. Hopefully it means my sister-in-law and I will both be more organised this year! 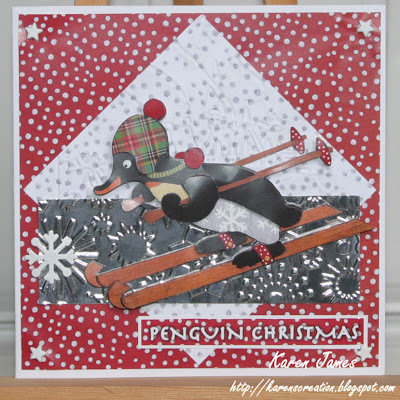 I have followed the 'Just Christmas and Birthday Cards' sketch #53 (and added a penguin, as you do, LOL) to get started for next year, and I have the recipient in mind: He loves penguins! 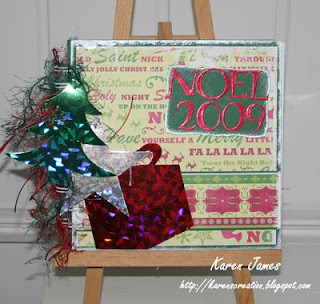 Papers and decoupage sheet by Patchwork Kingdom; embossing using Cuttlebug Winter House and Snowflakes folders. J'ai commencé mes cartes pour Noël prochaine ! Une carte selon le sketch #53 sur 'Just Christmas and Birthday cards'. Papier et feuille de découpage de Patchwork Kingdom; embossage avec la Cuttlebug (Maison d'hiver et flocons de neige). Here's a look at the cover and first pages of my Christmas mini-album using We Are Memory Keepers double-sided 'Whiteout' cardstock with recycled tags from our presents, title die-cut with the Cuttlebug and all held together with the Bind-It-All. The tags inside now have photos or journalling on the reverse. 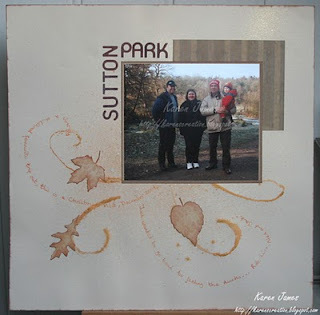 For the first page I cut the holly shape before slotting the photo behind it and mounting it on the inside cover. Les premieres pages de mon mini-album de Noël. J’ai bien utilisé les étiquettes des cadeaux (recyclage !) avec les formes découpé avec la Cuttlebug, papiers de We Are Memory Keepers, reliuré avec la Bind-It-All. Toutes les étiquettes dedans ont les photos ou écriture sur le verso. 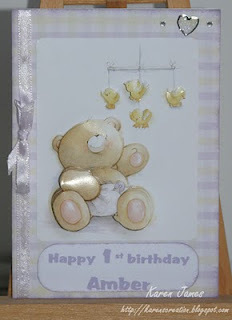 It's our grand-daughter's 1st birthday Monday so I finished this card last night to be posted with her presents today! It fits two current challenges too: Forever Friends of having 2 layers + ribbon + something sparkly, and the Spoon Full of Sugar challenge of including a heart. When looking for ideas of what to do I came across this FF decoupage set I bought some time ago so the backing paper, decoupage and sparkly heart is from there and I added the gems, ribbon and typed text, inked with ColorBox chalk. Une carte pour le premier anniversaire de notre petite-fille: Un découpage créé avec un set de 'Forever Friends' - papier, découpage et planche de stickers (j'ai utilisé le sticker de coeur). J'ai ajouté les petites pierres, ruban, et le texte qui j'ai imprimé et encré aux bords avec ColorBox craie. J'ai suivi deux challenges: Forever Friends qui demande l'utilisation de deux fonds + ruban + quelque chose scintillent, en plus le challenge de Spoon Full of Sugar parce que j'ai utilisé un coeur! Oops, where did December go?! I made hundreds of cards to help raise money for the Téléthon charity and sent the least ever to my own family and friends just because I ran out of time. As many French send them for new year rather than Christmas, I am still getting them posted here. We spent Christmas in the UK so I was away for 10 days too! So while I get back in to card-making, here are 2 pages I made in December: One recording the tree-decorating and one using the original printed photo from my pre-digital days of December 26th 2001: It has become a tradition to go for a morning walk and we did it again this year. I shall be back with a mini-album of my 2009 Christmas photos. I hope you enjoyed the holidays and I wish you all the best for 2010. J'était trop occupé en décembre : J'ai créé et vendu beaucoup de cartes au profit le Téléthon mais je ne trouve pas les temps pour envoyer mes cartes! Voici, deux nouveaux pages pour souvenir les fêtes : Une page où mon fils a confectionné l'arbre et une page du 26 décembre 2001: Le 26 décembre est un jour férié en le Grande Bretagne et il est une tradition pour ma famille se promenade dans le matin. Je te souhaite meilleurs voeux pour une très bien 2010. 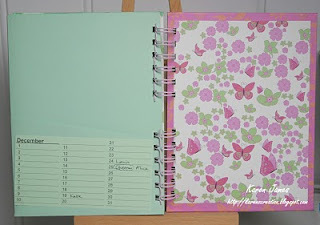 J'ai utilisé: Page d'arbre: Bazzill embossé 'clover leaf', DCWV Holidays bloc prédécoupé, Cuttlebug boule 'Pour toi' et alphabet 'Harmony', fleurs et petite arbre de Prima. Page de notre promenade: Mes carton et chutes de papiers avec les matrices 'feuilles' de Cuttlebug, vaporiseurs de Cosmic Shimmer, stylo Sakura Stardust et encreur VersaMark 'gingerbread'. La plupart disponible ici ou demande-moi. Used: Tree page: Bazzill swiss embossed 'Clover Leaf', DCWV die-cut Holidays, Cuttlebug with 'For you' bauble combo & Harmony alphabet, Prima flowers and paper tree. 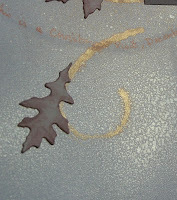 Walk page: Card and paper scraps from stash, Cuttlebug 'Leaves' dies, Cosmic Shimmer sprays (also dragged with the removed nozzle! ), Sakura stardust pen, VersaMark: Gingerbread.